Winners of the Jeannie Lin giveaway! A big thank-you to Jeannie Lin and to everyone who commented on my interview with Jeannie Lin! Jeannie is very generously giving away a copy of two of her books. I’ve emailed you both asking for your addresses, so if you haven’t received my email then please check your spam folder. Everyone, this week Rose Lerner is sharing some helpful tips on writing characters with accents. Leave a comment for a chance to win her beautifully written historical romance A Lily Among Thorns. 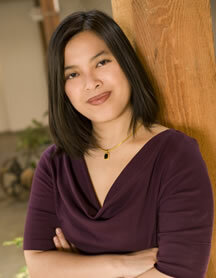 Interview with Jeannie Lin – and giveaway! 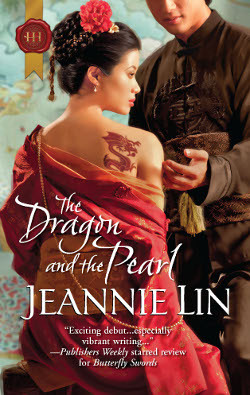 A couple of years ago, Jeannie Lin burst onto the romance scene with her Golden Heart contest entry, set in China during the Tang dynasty. Romance readers had to wait over a year to be able to read Butterfly Swords, but everyone agreed it was well worth the wait—and it certainly revitalized my interest in historicals set in unusual eras. Welcome to my blog, Jeannie! 1. What drew you to Tang Dynasty China in the first place? The Tang Dynasty was the Golden Age of imperial China. It was a time when China was truly the center of the world and traders and merchants all over Asia and Central Asia came to the capital of Changan. I felt it was both a time of wealth and elegance, but also a time of danger and intrigue. And on top of that, it was visually inspiring. Great cinematography for a story, you know? The most important aspect for me was that it was a time when women had more independence. It was a historical period with ideals of meritocracy and empowerment that resonated in modern times. 2. What’s the strangest thing you’ve learned about Chinese history during your research? This is cross-posted at The Season. I love short stories. I studied them in college and some of my all-time favorite authors (like Flannery O’Connor and Angela Carter) wrote brilliant short stories. I’ve never been a big fan of romance short stories, though—until recently. Last year I won a copy of Jeannie Lin’s The Taming of Mei Lin. It sucked me right in, and, best of all, I didn’t have to stay up late and go to work bleary-eyed just so I could finish reading it. Then, recently, the amazing Suzanne Johnson posted a short story on her site. Now, Suzanne’s one of my critique partners and I get to read her stuff regularly, but her first novel isn’t being published until next year, so her short story Chenoire is a (free!) taster for the rest of you. Let me tell you, the world Suzanne has created is amazing. Think about all the strange things you hear about from the Deep South. Now add fantasy and paranormal characters, and a wicked funny voice. That is the recipe for a Suzanne Johnson story. After reading the wonderful Chenoire, I discovered Kelly Fitzpatrick was giving away her short story Holiday Hostage. Kelly is one of my favorite people to follow on Twitter. Every conversation I have with her leaves me clutching my sides. So an opportunity to check out what her writing style’s like? I’m all over that. Holiday Hostage is funny and full of attitude—like Kelly’s tweets, but longer. Even though I never ever ever buy e-books (no e-reader, and I hate reading on my laptop), I bought Kelly’s debut novel Lily in Wonderland. Yep, couldn’t help it. The short story gave me a taste of Kelly’s voice, and I had to have more. Aside from being short and easy to consume when you don’t have much time, one great benefit of these stories is that they’re cheap (or free) ways of trying out a new author. You don’t need to invest much time or money and end up disappointed and broke. Do you like reading short romance stories? Have you ever bought an author’s novel after loving their short story writing style? A passion-packed short story left me desperate for more. In a genre that can sometimes feel quite limited in scope, it’s unfortunate – but probably natural – that a lot of the reviews Jeannie Lin will get will focus on the setting instead of the writing. But after reading The Taming of Mei Lin, a very short story released by Harlequin Historical Undone on 1 September, I found myself eager to read more because Jeannie Lin’s beautiful writing style drew me so deeply in to this fascinating time period. The Taming of Mei Lin is set in China in 710 A.D. Around 35-pages long, it’s the prequel to her novel Butterfly Swords, which will be released in October by Harlequin Historical. The heroine, Mei Lin, is being harassed by a local official because she spurned his offer of marriage, declaring that she’d only marry a man who beat her in a sword fight. When gorgeous Shen Leung – a legendary wandering swordsman – arrives in her village and tests her skill, she realizes he’s her one chance to escape her lonely life. More than that, though, she’s drawn to him in a way she’s never been to anyone.